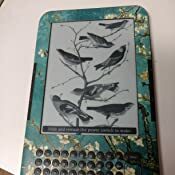 Display Amazon's 6" diagonal electronic paper display, optimized with proprietary waveform and font technology, 600 x 800 pixel resolution at 167 ppi, 16-level gray scale. Size (in inches) 7.5" x 4.8" x 0.335" (190 mm x 123 mm x 8.5 mm). System Requirements None, because it's wireless and doesn't require a computer. Check wireless coverage. 3G Connectivity HSPDA modem (3G) with a fallback to EDGE/GPRS; utilizes Amazon Whispernet to provide wireless coverage via AT&T's 3G high-speed data network in the U.S. and partner networks outside of the U.S. See Wireless Terms and Conditions. Documentation Quick Start Guide (included in box) [PDF]; Kindle User's Guide (pre-installed on device) [PDF]. Additional information in multiple languages available online. My review is now over a year old, as is the "Kindle Keyboard" as Amazon calls it now. There are newer models: the basic, cheapie Kindle and the Kindle Touch, and of course the Kindle Fire quasi-tablet. Each of these models is an excellent choice. Whichever one is right for you just depends on your preferences. The 3 e-ink Kindles are Kindle Keyboard (this one), Kindle Touch (the newest "flagship" model), and the basic Kindle. All 3 of them have EXACTLY THE SAME 6" DISPLAY, with the same sharp typeface and high contrast that reads like ink on paper with no eyestrain. The Kindle Keyboard is the oldest of these models, and I got one of the first ones when they came out in August 2010. I still absolutely LOVE my Kindle Keyboard and use it almost every day. I have read dozens of books on it. 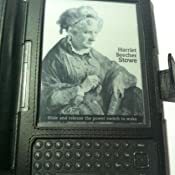 I like the newer models, they have some neat features, but the experience of reading a book on them is no better or worse than on my 1-year-old Kindle Keyboard. Page turns are now smoother and faster on the newest Kindles, but the difference is not enough to make it worth the cost of upgrading, in my opinion. The touch-screen interface of the Kindle Touch is pretty neat. But, unlike my iPad, I only use my Kindle to read books, and reading books is just as nice on any of the current Kindle models. I don't consider the touch screen a "must have" feature, and I'm normally obsessed with having the latest version of every tech product I own. For that reason, I think the cheapest Kindle is an excellent choice. 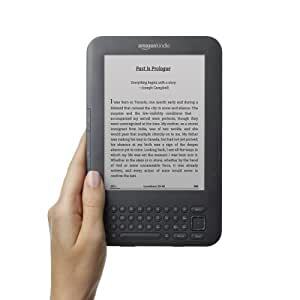 It has less memory than the Keyboard or Touch, but it has plenty enough for 100s of books, and of course you always get free storage in the Amazon cloud for any books that you don't need to have on your device at this moment, such as books you've already read. All your Kindle books are automatically stored in Amazon's cloud, whether they're on your device or not, and getting them back on your device is super-easy, regardless of which Kindle model you have. If this will be your first e-reader, you can choose one of these Kindle models or the Barnes and Noble Nook Simple Touch. The Nook Simple Touch has the same 6" e-ink display as the 3 Kindle models, but different typefaces. I think the letters are a little sharper on the Kindles, but the Nook Simple Touch typefaces are also very readable, plus you get a few more choices of typefaces compared to the Kindle. Those are the e-ink Kindles and Nooks. Of course, you might be considering one of the quasi-tablets, Kindle Fire or Nook Tablet. Both are excellent, both have their strengths. Nook Tablet's main advantage is it has twice the internal memory as Kindle Fire - but B&N only lets you use a small fraction of it for third-party content, whereas you can use all of KF's available memory for 3rd party content. And, KF is more affordable. 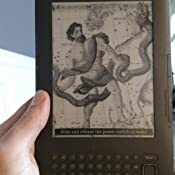 In my opinion, the real deciding factor between a Kindle product and a Nook product is not any specific feature of the hardware or software - both product families are excellent. The real decision point is whether you prefer living in Amazon's universe or Barnes & Noble's. Content you buy from Amazon only works with Kindles, while content you buy from B&N only works with Nooks. Both universes have their advantages, so it's a matter of personal preference. B&N's main advantage is you can take your device into your local B&N store and get real assistance from a human being. But Amazon has dedicated customer service lines for Kindle support and you can get a real human on the phone very quickly (in my experience), and they are very helpful. Plus, Kindles and Nooks are generally very easy to use, so you'll probably need very little tech support. I'm already heavily invested into the Amazon universe, having purchased many dozens of Kindle books; plus, I have an Amazon prime membership, which to my family is very worth the cost (you get free streaming video of TV shows and movies plus unlimited free 2-day air shipping on most Amazon purchases). So if my Kindle were lost or stolen, I'd buy another Kindle product rather than a Nook product. Whatever you buy, you'll probably be happy. The choices available now are quite good, and prices are better than ever. It's hard to believe that the basic Kindle at only 79 bucks performs better and costs 1/3 as much as the now two-year-old Kindle 2 (an older, slightly larger version of the Kindle Keyboard). If you're considering the Kindle keyboard, you can read my original review of it below. (Sorry it's so long!) The "nook" it refers to is the "Nook first edition," which was fine in 2009 but is a poor choice by the standards of currently available Nook and Kindle models. If you're trying to choose between a Nook and a Kindle, perhaps I can help. I and family members have owned a Nook (the original one), a Kindle 2, and a Kindle DX. 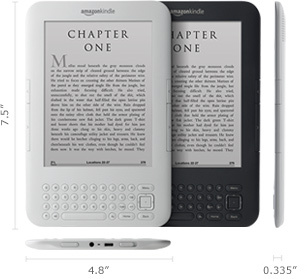 When Amazon announced the Kindle 3 (Kindle Keyboard) in summer 2010, I pre-ordered two Kindle 3's: the wi-fi only model in graphite, and the wi-fi + 3G model in white. They arrived in late August and we have used them very regularly since then. For us, Kindle is better than Nook, but Nook is a good device with its own advantages that I will discuss below. I'll end this review with a few words about the Nook Color. In our experience, the Kindle is very zippy compared to the Nook. Page refresh speed (the time it takes a new page to appear after you push the page-turn button) was WAY quicker on Kindle 2 than on Nook, and it's quicker yet on Kindle 3. Yet, I read a whole book on the Nook and didn't find the slower page refresh to be annoying - you get used to it, and it's not a problem. For me, the more important speed difference concerns navigation - moving the cursor around the screen, for example to pick a book from your library, or to jump to a chapter by selecting it in the table of contents. On Kindle, you do this by pushing a 5-way rocker button, and the cursor moves very quickly. On Nook, you do this by activating the color LCD touchscreen (which normally shuts off when not in use, to conserve battery). A "virtual rocker button" appears on the screen, and you touch it to move the cursor. Unfortunately, the Nook cursor moves very sluggishly. This might not be a big deal to you, but it really got annoying to me, especially since my wife's Kindle was so quick and responsive. In November 2010, Nook got a software upgrade that increases page refresh speed and makes navigation more responsive. 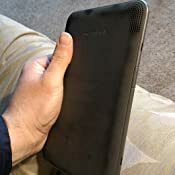 I returned my Nook months ago, so I cannot tell you if the Nook's performance is now equal to the Kindle's, but Nook owners in the comments section have convinced me that the software update improves the experience of using the Nook. If performance is a big factor in your decision, visit a Best Buy and compare Kindle and Nook side by side. You've seen Amazon's claims that the Kindle 3 e-ink has 50% better contrast than Kindle 2 or other e-ink devices. I have no way of precisely measuring the improvement in contrast, but I can tell you that the Kindle 3 display definitely has more contrast than Kindle 2 or Nook. The difference is noticeable, and important: more screen contrast means less eyestrain when reading in poorly lit rooms. Nook weighs about 3 ounces more than the new Kindle, and you can really feel the difference. Without a case, Nook is still light enough to hold in one hand for long reading sessions without fatigue. But in a case, Nook is a heavy sucker. The new Kindle 3 is so light, even in a case, we find it comfortable holding in one hand for long reading sessions. If you need help with your nook, you can take it to any barnes and noble and get a real human to help. You can take your nook into the coffee shop section of your local B&N store and read any book for free for up to one hour per day. When you take your nook to B&N, some in-store special deals and the occasional free book pop up on your screen. Rechargeable batteries eventually lose their ability to hold a charge. Nook's battery is user-replaceable and relatively inexpensive. To replace Kindle's battery, Amazon wants you to ship your Kindle to Amazon, and they will ship you back a DIFFERENT Kindle than the one you sent (it's the same model, for example if you send a white Kindle 3, you get a white Kindle 3 back, but you get a "refurbished" one, NOT the exact one you sent them). I don't like this at all. However, several people have posted comments here that have eased my concerns. Someone looked up statistics on the Kindle's battery and did some simple calculations to show that it should last for 3 or more years. Before that happens, I will surely have upgraded to a newer Kindle model by then. Also, someone found some companies that sell Kindle batteries at reasonable cost and have how-to videos that demonstrate how we can replace the battery ourselves. Doing this would void the Kindle's warranty, but the battery will probably not fail until long after the warranty expires. Nook uses the ePub format, a widely used open format. Amazon uses a proprietary ebook format. Many libraries will "lend" ebooks in the ePub format, which works with nook but not kindle. However, a free and reputable program called Calibre allows you to translate ebooks from one format to another - it supports many formats, including ePub and Kindle. The only catch is that it doesn't work with copy-protected ebooks, so you can't, for example, buy a Kindle book (which is copy protected) and translate it to ePub so you can read it on a Nook. The original Nook has a small color LCD screen on the bottom for navigation. This could be a pro or con, depending on your preferences. It makes the Nook hipper and less drab than Kindle. Some people enjoy using the color LCD to view their library or navigate. I did, at first. But after two weeks of use, and comparisons with my wife's Kindle, I found the dedicated buttons of the Kindle easier and far quicker to use than the Nook's color touchscreen. I also found the bright light from the color screen distracting when I was trying to read a book or newspaper (though when not in use, it shuts off after a minute or so to conserve battery). Nook comes with 2GB of internal memory. If you need more capacity, you can insert a microSD card to add up to 16GB more memory. Kindle comes with 4GB of internal memory - twice as much as Nook - but there's no way to expand that. Kindle doesn't accept memory cards of any type. If you mainly use your device to read ebooks and newspapers, this shouldn't be an issue. I have over 100 books on my Kindle, and I've used only a tiny fraction of the memory. Once Kindle's memory fills up, just delete books you don't need immediate access to; you can always restore them later, in seconds, for free. Kindle and Nook have other features, such as an MP3 player and a web browser, but I caution you to have low expectations for these features. The MP3 player on the Kindle is like the first-generation iPod shuffle - you can't see what song is playing, and you can't navigate to other songs on your device. I don't like the browser on either device; e-ink is just not a good technology for surfing the web; it's slower and clunkier than LCD screen technology, so even the browser on an Android phone or iPod touch is more enjoyable to use. However, some commenters have more favorable views of either device's browser, and you might, too. If you have a Nook or a Kindle, you can "lend" an ebook you purchased to someone else with the same device for up to two weeks. The Nook has always had this feature. The Kindle just got this feature as of December 2010. Most but not all purchased ebooks are lendable, due to publisher restrictions. Kindle and Nook both handle PDF files, but in different ways. When you put a PDF file on your nook, nook converts it into an ebook-like file, then you can adjust the font size, and the text and pagination will adjust just like with any ebook. But you cannot see the original PDF file in the native format in which it was created. Kindle 3 and Kindle DX have native support for PDF files. You can see PDF files just as they would appear on your computer. You can also convert PDF files to an ebook-like format, and then Kindle handles them just the way the Nook handles them - text and pagination adjust when you change the font size. Unfortunately, some symbols, equations, and graphics get lost or mangled in the translation - even when viewing PDF files in their native format on the Kindle. Moreover, the small screen size of the Kindle 3 and the Nook is not great for PDF files, most of which are designed for a larger page size. You can zoom and pan, but this is cumbersome and tiresome. Thanks to commenters who suggested viewing PDF files in landscape mode on the Kindle (I don't know if you can do this on Nook); this way, you can see the entire top half of the page without panning, and then scroll down to the bottom half. This works a little better. Nook and Kindle each offer their own advantages. We like the nook's user-replaceable battery, compatibility with ePub format, and in-store experience. But we strongly prefer Kindle 3 because its performance is zippier, its higher-contrast screen is easier to read, and it's smaller and lighter so it is more portable and more comfortable to hold in one hand for long reading sessions. The Kindle is my first e-ink reader. I own an iPad, an iPhone, and have owned a Windows-based phone in the past that I used as an ereader. My overall impression of the device is good. I'd honestly rather read linear (read from page one to the end, one page at a time) fiction from it than a book, because I can't always get comfortable with a book. Hardcovers are sometimes a bit heavy, and paperbacks don't always lie open easily. The Kindle is incredibly light and thin. I can hold it in one hand easily. The page turn buttons are conveniently located. Page-turns aren't instant, but they're probably quicker than turning a physical page in a printed book (there are just a lot more page-turns unless you choose a small font). The contrast is better than other ereaders I've seen. There is zero eye strain in good light. My eyesight isn't the greatest and I like being able to increase the font size and read without glasses. I love being able to browse the Kindle store and read samples before deciding to purchase. The "experimental" browser is surprisingly usable, but isn't great. It is useful for browsing wikipedia and blogs. The biggest drawback to the browser is the awkward pointer navigation, using the 5-way pad. It syncs your furthest read page over the internet so you can pick up where you left off using your iPhone or iPad. The kindle store could use more categories and sorting options. You can't sort by "top rated," and there is no category for "alternate histories," for example. Finding a very-specific type of fiction relies on keyword searches, which don't do a great job. The wifi sometimes doesn't connect before it times-out. You rarely need the wifi, but it is annoying if you change a setting, answer "OK" to the prompt to connect, and the thing tells you it failed to connect two seconds later (the exact moment it indicates that it did finally connect, then you need to go back to update the setting again). Most settings don't require a connection, but it is a minor annoyance. Most of your time will be spent reading, and of course your books are stored on the device and a connection is not required. Part of me wishes I'd bought the 3G model, because the browser is good enough that having lifetime free 3G wireless would be worth the extra money. Magazines don't look very good and are not very easy to navigate. There is minor glare in some lighting conditions, mostly when a lamp is positioned behind the reader's head. The contrast is fair to poor in dim light. It is much easier to read a printed page in dim light. In good light, contrast is on par with a pulp paperback. In dim light it feels almost like reading from an old Palm Pilot (resolution is better than an old Palm, but contrast is bad in dim light). The screen is small enough that the frequency of page turns is pretty high. Even in good light, the light gray background is less pleasant than the eggshell background of a printed page. You must tell it to sync before you switch it off, if you expect the feature allowing you to pick up where you left off using other devices to work correctly. The copy protection prevents you from using the files on anything other than Kindle software or devices. IPad is a lot better for magazines, reference materials, and illustrated materials. Kindle is worlds better for reading novels. IPad is pretty heavy, making it more difficult to hold in your hand or carry with you everywhere. Kindle is much more portable and easier to hold. IPad has some amazing children's books and magazines, which take advantage of its multimedia features. IPad is unreadable in sunlight and glare is bad in bright light. Kindle is as good as a printed page in bright light. Ipad serves as a creative tool, a computing tool, a gaming tool, and a communication tool. Kindle is only a novel machine. I don't regret buying either one of them. An iPad won't replace books, but a Kindle can, if the book is text-only. I highly recommend this device at its new low price if you are a frequent reader of novels. I love my kindle. Just don't expect it to be more than it is. Leave the magazines and such to the tablet computers.